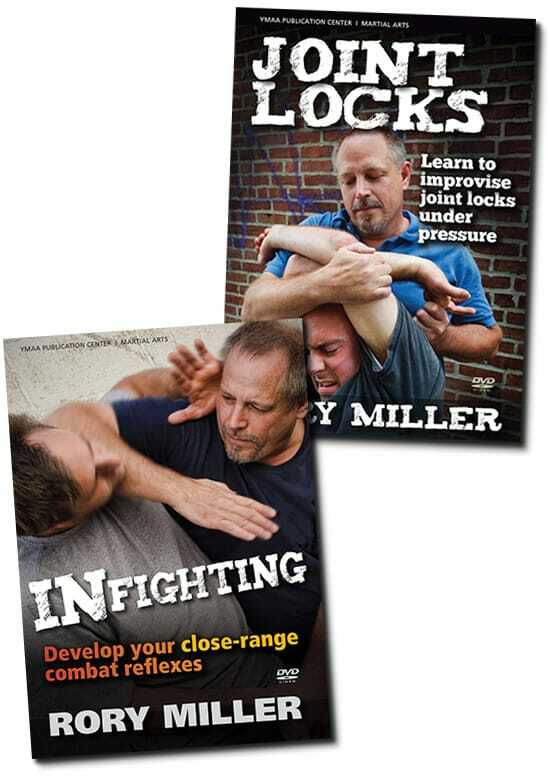 Develop your close-range COMBAT REFLEXES and JOINT LOCKING skills with Rory Miller. Infighting is close-range combat, in which you defend yourself while simultaneously controlling the opponent’s limbs, transferring his momentum, and forcing him off center.Distance is time and if you're fighting at zero distance you have no time to waste. Offense and defense cannot be separated. You must be able to act on your opponent without needing to know what the opponent is doing, because by the time you know, it is too late. Joint locks are widely regarded as one of the most versatile physical tools-- they can move, immobilize, submit or severely injure a threat. They are also justifiably regarded as one of the more difficult of martial arts skills to implement in real life. In this video, Rory Miller makes the case that the problem is not with the locks themselves, but with our teaching methods. A principles-based approach allows relative beginners to improvise joint locks with one hour of training, something that many traditional approaches have failed to do with hundreds of hours. Joint locks are NOT primary self-defense techniques. If you are in a position that requires self-defense you are justified in and likely need a higher level of force. However, if your job requires controlling violent people with minimal injury you must be good at joint locks and you must be able to improvise them under pressure. Infighting is close-range combat, in which you defend yourself while simultaneously controlling the opponent’s limbs, transferring his momentum, and forcing him off center. “What is infighting? You can call it standing grappling. You can call it a variation on clinch range. Infighting is close contact, chest-against-chest, halitosis range. You are close enough to throw, sweep, strike, strangle, gouge, bite...and not too close to kick, if you know how. Infighting has the most possibilities, and thus the most variables, of any fighting range. And it is quick. Distance is time and if you're fighting at zero distance you have no time to waste. Offense and defense cannot be separated. You must be able to act on your opponent without needing to know what the opponent is doing, because by the time you know, it is too late.